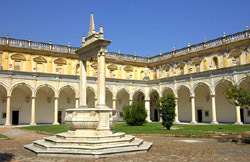 The Certosa di San Martino (Italian St. Martin's Charterhouse) is a former monastery complex, now a museum, in Naples, southern Italy. It is the most visible landmark of the city, perched atop the Vomero hill that commands the gulf. A Carthusian monastery, it was finished and inaugurated under the rule of Queen Joan I in 1368. It was dedicated to St. Martin of Tours. During the first half of the 16th century it was expanded. Later, in 1623, it was further expanded and became, under the direction of architect Cosimo Fanzago, essentially the structure one sees today. In the early 19th century, under French rule the monastery was closed and was abandoned by the religious order. Today, the buildings house a museum with a display of Spanish and Bourbon era artifacts, as well as displays of the presepe--Nativity scene—considered to be among the finest in the world.